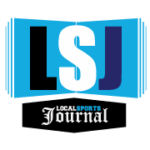 RICHLAND – The Fruitport Calvary Christian girls basketball team played in its first state quarterfinal game on Tuesday, and set a new standard for its school in the process. 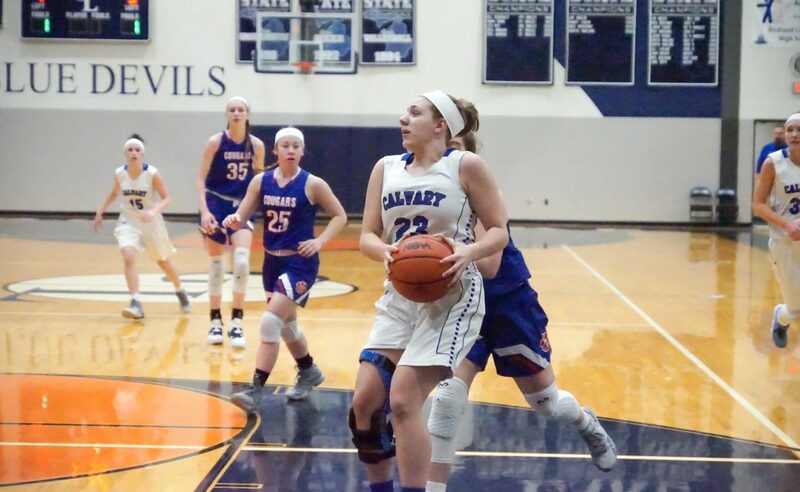 Fruitport Calvary had never had a team advance beyond regionals in any sport. 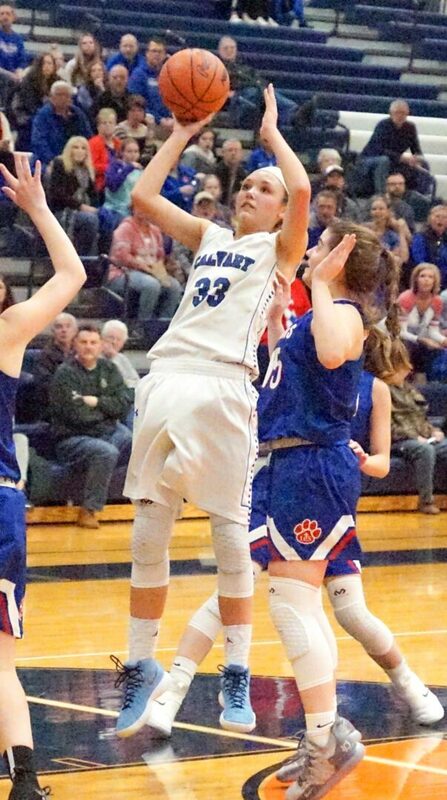 The Eagle girls were hoping to go even farther in the state basketball tournament, but ran into a buzz-saw and lost to defending state champion Adrian Lenawee Christian 59-32 in the Division 4 quarterfinals at Richland Gull Lake High School. The Eagles finished their remarkable season with a 20-6 record. 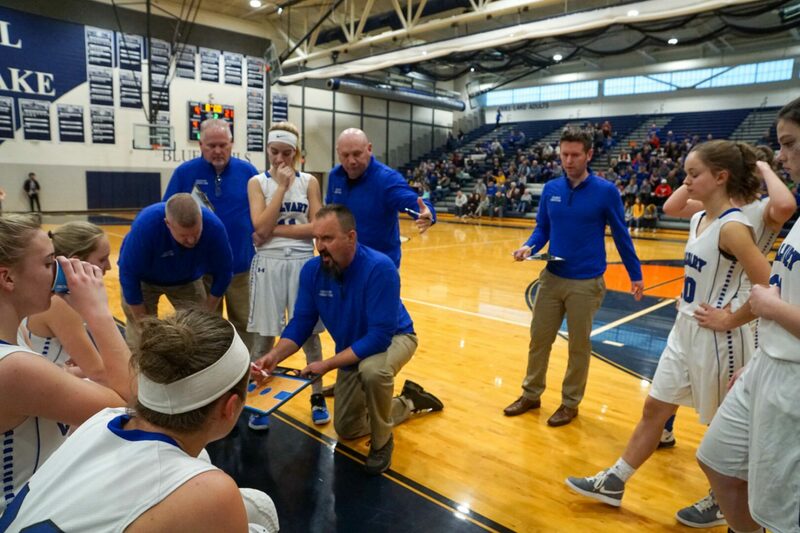 Along the way they won their seventh straight Alliance League title, sixth straight district championship and first ever regional championship. All in all, it was an exciting ride for the team, as well as the entire school, which has a total enrollment of about 60. The Eagles struggled to contain the Cougars’ star player Bree Salenbien, who scored a game-high 28 points. “She was just doing moves that were pretty darned impressive,” Richards said. 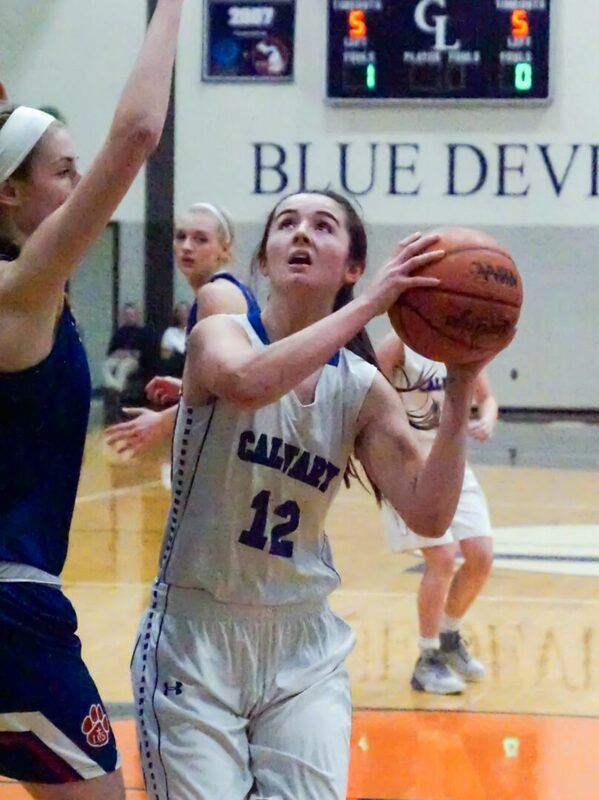 Fruitport Calvary trailed 21-9 after the first quarter and 34-20 at halftime. Kelsey Richards, the Eagles’ leading scorer, struggled during the first half, scoring just two points. 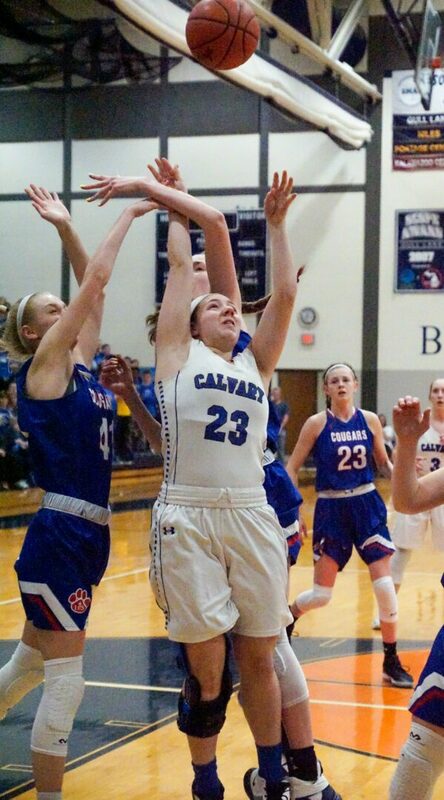 Brionna Johnson had a team-high eight points for Calvary in the first two quarters while Lizzie Cammenga scored seven. 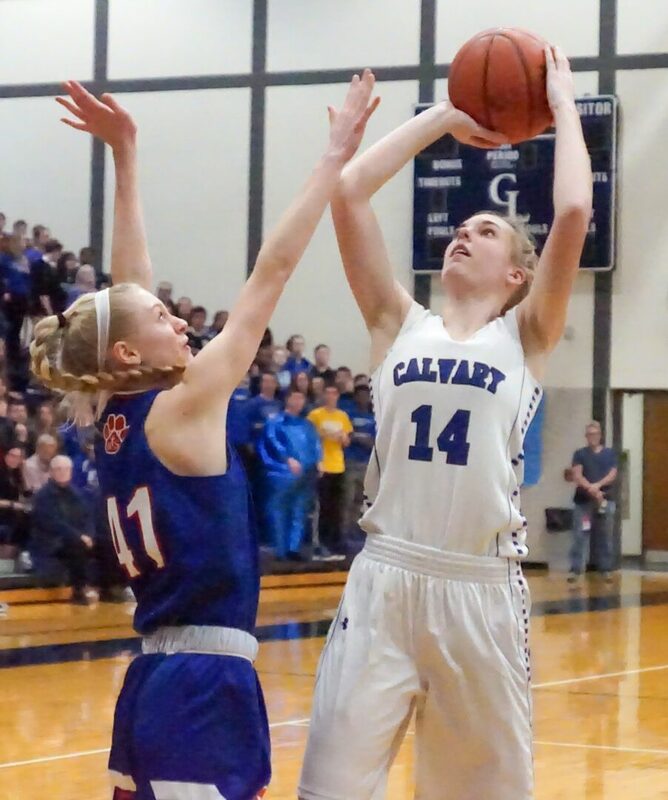 The Cougars shut down Fruitport Calvary defensively in the second half, allowing only four third- quarter points and eight in the final stanza. They led 48-24 heading into the fourth quarter. The Cougars closed out the game with an 11-8 fourth quarter advantage. Despite the outcome, Richards was impressed that a big crowd from the school again made a long drive to cheer the team on. “You saw the whole school was here,” said Richards. “It’s a very unique, special thing to be a part of, and I am just blessed and humbled to be a part of this, and we are just sad that it’s over. The Eagles were paced by Richards with 11 points, Johnson added 10 and Cammenga totaled eight.